The setup CD is lost, misplaced or not available. The computer has no CD drive. Linksys has different types of adapters. If you have one (1) of the following types, follow the steps on how to connect the adapter (hardwire) to the computer or laptop. For a USB adapter — Plug the USB adapter to any available USB port of your computer or laptop. For a PCI adapter — Open your computer’s case and locate an available PCI slot. Slide the adapter into the PCI slot. PCMCIA adapter — Locate and insert the adapter in an available PCMCIA slot on the side of your laptop. For detailed instructions on how to connect the adapter to the computer or laptop, click here. After inserting your adapter to your computer, download the correct driver for the adapter that you want to install. To know how to download the latest drivers from the Linksys Support Site, click here. Once the network adapter is plugged in, a Found New Hardware window will pop-up. Click on Locate and install driver software (recommended). The next instruction you will see is to insert the disc that came with your wireless network adapter. Click on I don’t have the disc. Show me other options. Click Browse my computer for driver software (advanced). Locate the folder of your driver. In this example, VISTAX86 is selected for the Linksys WUSB54G. Wait for the computer to install the driver software. Your driver software is now installed. To learn how to update the driver of your network adapter, click here. On the Start screen, hover your cursor to the upper-right corner of the screen. Select the Search charm. In the Search field, type “control panel”. Once the All Control Panel Items window opens, locate and select Device Manager. On the Device Manager window, locate Other Devices. Expand this device by clicking on the Flag icon. You should be able to see your Linksys adapter model. NOTE: In the example below, a Linksys AE3000 adapter is used. The adapter has a yellow warning icon which means that it has been detected by the computer but is not yet configured properly to be fully functional. Right-click the device and select Update Driver Software… from the menu. Select the folder of your adapter's driver. Click the Browse… button to launch the Browse For Folder window. Once the driver folder is selected, click OK. NOTE: If the driver is not available on your computer, you may download it from the Linksys Support Site. For detailed instructions on how to download the latest driver of your Linksys wireless adapter, click here. 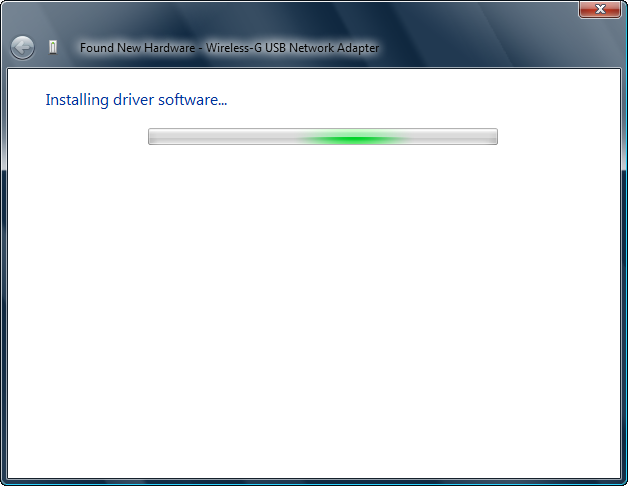 Wait until the installation of the Linksys adapter driver is completed. NOTE: Do not unplug your Linksys adapter and avoid turning off your computer at this time. 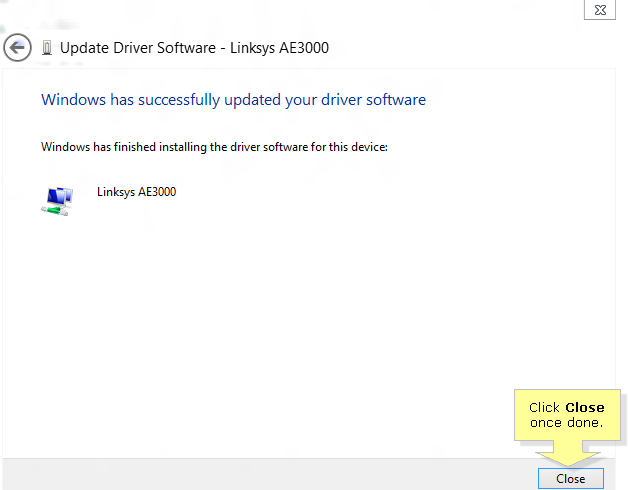 Once the installation is successful, the Windows has successfully updated your driver software message will be displayed. Click the Close button to exit. Your driver software should now be updated. Click and enter “Device Manager” in the Search field. If you are using Windows XP to access Device Manager, click here. Under Other devices, right-click on the adapter that you want to install the driver for and click Update Driver Software…. NOTE: In this example, the Wireless-G USB Network Adapter is used. In the How do you want to search for the driver software? window, click Browse my computer for driver software. 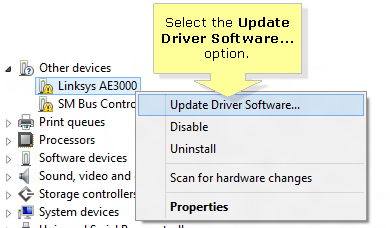 In the Browse for driver software on your computer window, click Let me pick from a list of device drivers on my computer. Click Network adapters under Select your device’s type from the list below. Click Next. In the Select Network Adapter window, click the Have Disk… button. In the Install From Disk dialogue box that appears, click the Browse… button. Locate and select the driver folder that you have previously downloaded and then click Open. NOTE: In this example, the VISTAX86 folder with the .inf file was used. Wait for the computer to complete the installation of the driver software. A window will appear saying Windows has successfully updated your driver software. Click Close. The adapter is now installed and may be used to connect to wireless networks. Check if your computer meets the minimum system requirements and compatibility of the drivers you are downloading. To know more about your adapter’s minimum system requirements, check the documentation shipped with your device. During the installation of the drivers, disable any firewall software currently running on your computer as it may block some of the components being installed on your computer for your adapter to run. To learn how to disable your firewall, click here. Make sure that you are downloading the correct driver. For more instructions on how to download the latest driver of your Linksys wireless adapter, click here. After checking the items above, perform the installation steps again.